Get your favorite restaurant side dish at home with our Loaded Baked Potato Salad! 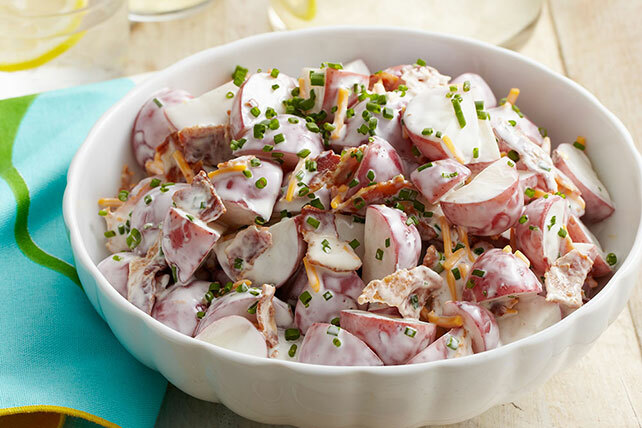 Chives, cheddar and bacon make this Loaded Baked Potato Salad so great. Cook potatoes in boiling water in saucepan 20 min. or until tender; drain. Cool. Mix mayo, buttermilk and chives in large bowl until blended. Add potatoes and cheese; mix lightly. Refrigerate 3 hours. Top with bacon just before serving. Save 60 calories and 8g of fat, including 2g of sat fat, per serving by preparing with KRAFT Light Mayo Reduced Fat Mayonnaise, KRAFT 2% Milk Shredded Cheddar Cheese and OSCAR MAYER Turkey Bacon. No buttermilk? Place 1 tsp. HEINZ Distilled White Vinegar in liquid measuring cup; fill to 1/4-cup mark with milk. Let stand 10 min. or until thickened, then use as directed. If a creamier consistency is desired, stir an additional 4-1/2 tsp. buttermilk into the salad just before serving.